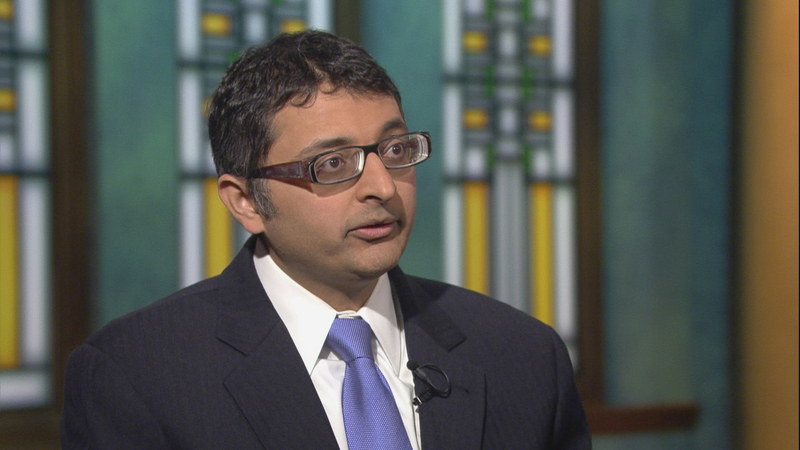 Illinois Public Health Director Dr. Nirav Shah appears on “Chicago Tonight” on Jan. 4, 2018 to discuss the state’s opioid epidemic. Illinois Public Health Director Nirav Shah told lawmakers Tuesday that he’s “proud” of the government’s response to an outbreak of Legionnaires’ disease at a state veteran’s home in downstate Quincy, even as Shah, Veteran’s Affairs director Erica Jeffries and Gov. Bruce Rauner are under siege for what critics say is a delayed reaction that put veterans at risk. Legionella is a naturally occurring water-borne bacteria that becomes a health hazard, commonly called Legionnaires’ disease, when people breathe in small droplets of contaminated water. Document: Read the CDC report A recent report from the Centers for Disease Control and Prevention expresses doubts that the bacteria can ever be fully eradicated from the facility, which has housed Illinois veterans since its founding in 1886. In 2015, Legionnaires’ killed a dozen residents of the Quincy home; 46 cases were reported that year. Five confirmed cases were reported in 2016; there were six last year. Rauner and his administration have been under scrutiny since WBEZ published a report last month featuring members of 11 families who are suing the state for negligence in administering care and waiting days to notify kin and the public of the outbreak, which they say caused or contributed to the deaths of their loved ones. Shah says it took a mere 27 minutes from when the IDPH first learned in 2015 of a second case of Legionnaires’ to notify the Quincy home and the local health department. He says the entire city’s water supply was scrutinized, and investigators had to research where the two men had contracted the disease—perhaps they had visited the same supermarket, or church. While Illinois has spent $6.4 million replacing plumbing and making other updates to the water system, lawmakers say the continued cases are troublesome. At least one, Rep. David McSweeney, R- Barrington Hills, called for a brand news veterans home to be built. “I’ll tell you right now, I’ll support it,” said McSweeney, a Rauner foe who has continually fought tax increases and added spending. Shah says that moving vulnerable, elderly populations can cause “transfer trauma”—one of the reasons that residents were not promptly moved out of the Quincy home. “If this is how the facility is at 100 years how do we expect it to last for another hundred? If we can’t fix this now, and this is not going to get done, these buildings aren’t getting younger, this isn’t going to getting easier, this isn’t going to get more cost effective, or cheaper, how are we going to get it done now so that our flagship veterans home—the one we’ve had longest-serving, that had Civil War veterans in it—remains and is a piece of the Quincy community,” said Sen. Tom Cullerton, D-Villa Park. Cullerton, who served in the U.S. Army, chairs the chamber’s Veterans Affairs committee and plans another hearing in Springfield on the matter. “We’re taking no option off the table,” Jeffries said. Jeffries says the veterans department has considered new pipes, which would cost an estimated $25 million to $30 million, but she says that too comes with risks, given that excavating plumbing can kick up dirt where Legionella bacteria also exists. Rauner, who is running for re-election, has called the situation a “tragedy” but in December refused to say whether he bears moral responsibility for it. Dec. 20: Thirteen veterans have died of Legionnaires' disease since 2015 at a state-run veterans home in Quincy. A new report by WBEZ reveals Illinois' top health official warned of the seriousness of the outbreak days before it was made public.